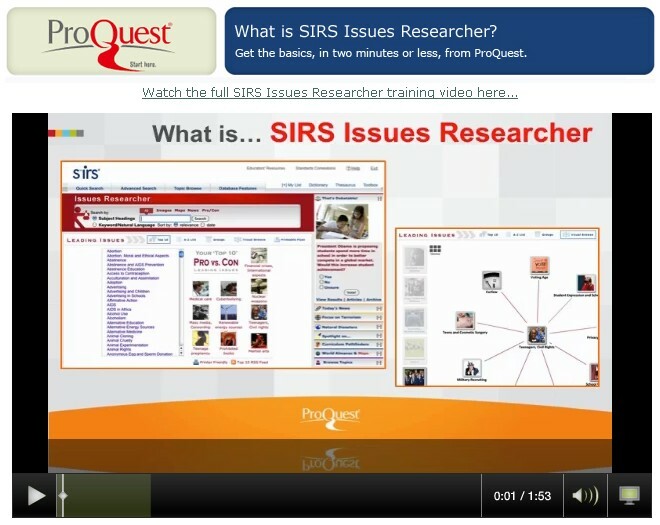 What is SIRS Issues Researcher? 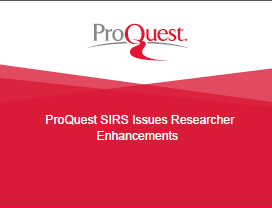 SIRS® Issues Researcher provides background and current analysis necessary for the research and understanding of 320+ current and pervasive Leading Issues. Analysis and opinions cover the pros, cons, and everything in between on the most researched and debated social issues. Editorially-created Topic Overview pages help build solid foundations for understanding each issue. Critical Thinking and Information Literacy skills are promoted through engaging Essential Questions with answers and viewpoint articles. All articles, websites, videos, multimedia graphics, charts, maps, statistics, primary sources and government documents are hand-selected from thousands of national and international sources. SIRS® Issues Researcher supports school curriculum and differentiated instruction through a wide-variety of features and tools including: Common Core, State and National standards correlations, article read aloud & language translation, Lexile scores, editorially written article summaries and citation generators. Research guides, Note Organizer, critical thinking skills builder, dictionary & thesaurus, and saved article lists aid all users throughout the research process. SIRS continues to 'Take Aim' at Common Core Standards with brand new SIRS Common Core Writing and Information Literacy Guides directly supporting requirements under the category of writing logical arguments to support claims, integrating quantitative analysis, reading informational text, and understanding statistics.